You are probably wondering what the Bayou Boys are doing with their extra days off during the week. I thought it’d be best to show you in pictures. We did some grillin’ and chillin’ Monday. It was a gorgeous day with a nice breeze. 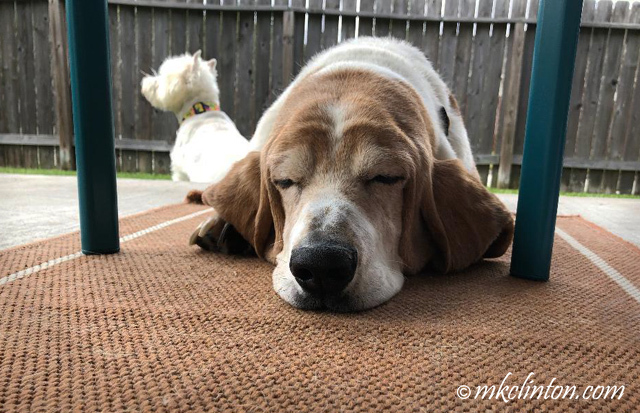 The boys love spending time on the patio under the ceiling fan. Of course, Bentley cannot resist lying out in the direct sunlight. It is something he has enjoyed since he was a puppy. 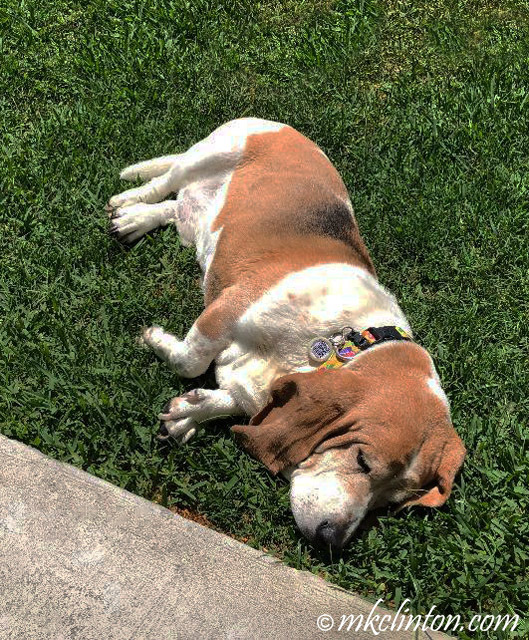 As a senior dog, I monitor how much sun he gets so that he never overheats. Pierre snuck his **Benebone into the yard. He LOVES this long-lasting chew and thankfully, Bentley wants nothing to do with it. Don’t tell him but we ordered another one for his birthday. grillin & chillin is a super important job... and eggs-hausting right? Having sun is awesome and I just cant get enough, but as you say, overheating is to be guarded against, too. Looks the perfect weather for relaxing and enjoying a chew. 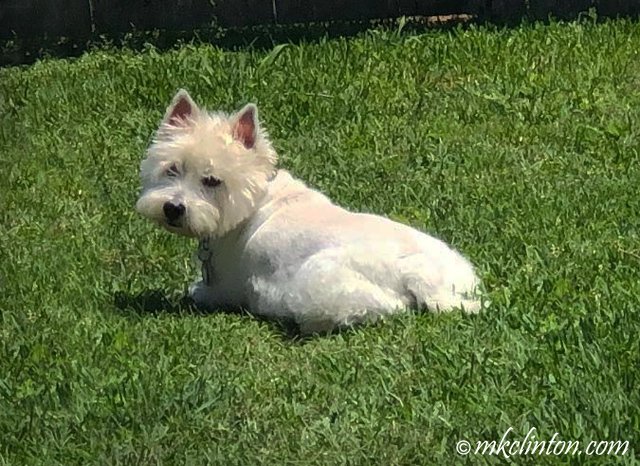 We've been enjoying some warmer springy days by playing more chase in the yard, and napping on the grass in the sunshine. That will all end today since we are supposed to get a massive snowstorm starting tonight. We'll see. Usually if there is a lot of hype we get nothing. Keep an eye on that grill boys! That is the meat of the backyard! You two sure were enjoying the nice sunny day and it doesn't get much better than that! We're still waiting for a nice warm day here. Right now it's snowing!!! Have a good nap pups! Wonderful days off! Enjoy the sunshine. Benebones are Rosy's favorite chew too! Looks like you all are enjoying some primo chillaxin'on your days off! We have had some incredibly beautiful weather for the past few days. 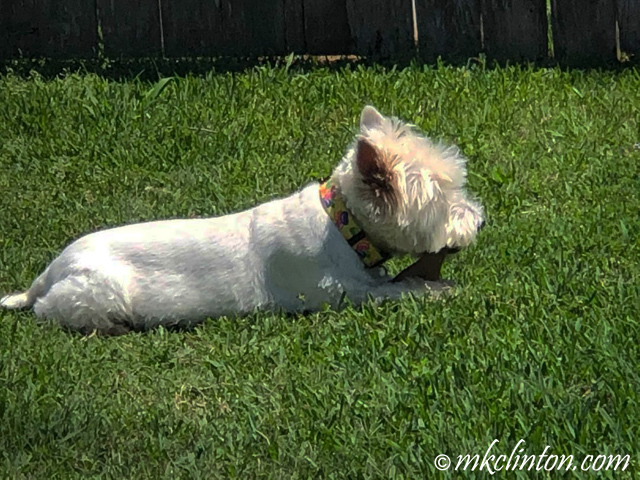 We three like to explore the yard, check for intruders, then either bask in the sun lying in the grass or camp out on the deck. We do like our winter weather, but this time of the year is really pretty nice too. You boys sure are living the good life! We're jealous of all your green grass and sunshine! Just adorable! I wish I could be there to hang out with those beautiful pups! How safe you must feel with these fearsome guard dogs on duty. Hey Jan! I can't leave a comment on your blog for some reason. It's been going on for a couple of days now. Ahhh...a nap in the sun! Sounds wonderful! Love it. 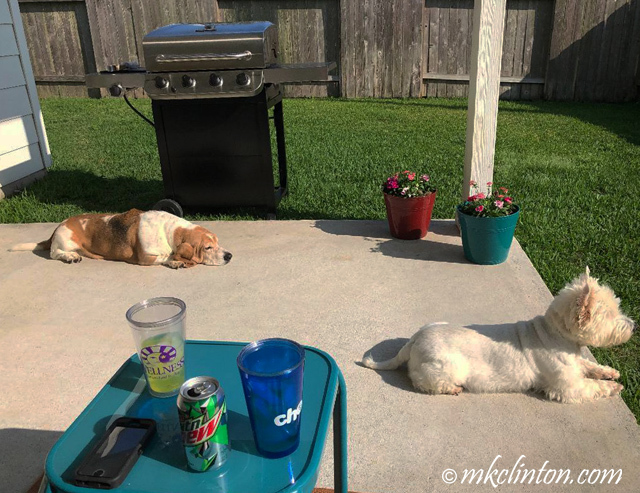 Grillin and chillin...sounds 'pawfect' to me on a beautiful day! You guys couldn't be spending your days any better! Looks like a nice, lazy day, until....Squirrel!!! You two are having some good times on your days off. It's always great for some grillin and some chillin in the beautiful sun. Thanks for the share. Have a wonderful rest of your day. OMC! We wish we were having some of the good weather you're having. Glad they are having fun. From the looks of things, one certain doggie is carrying all the heavy guard work while the other one is SLEEPING LIKE A LOG! I'm looking at YOU, B! You boys are pros at doing the day off thing! Enjoy!